The company said it asked a judge investigating a former Petrobras director, Paulo Roberto Costa, for access to his confidential statements. 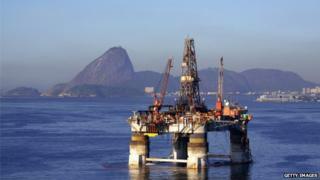 Petrobras said it had also written letters to companies allegedly involved in the scheme asking for help. The scandal comes less than a month before presidential elections. "Any irregular acts that may have been committed by a person or group of people, whether or not they are company employees, do not represent the conduct of the Petrobras institution and its workforce, made up of thousands of employees," said Petrobras in a statement. On Saturday, one of Brazil's leading magazines, published the names of more than 40 politicians whom Mr Costa had accused of involvement in the alleged scheme. In the magazine report, Mr Costa, who was head of downstream operations for Petrobras from 2004 to 2012, claimed that politicians received 3% commissions on the values of contracts signed with Petrobras when he was working there. He alleged that the scheme was used to buy support for the government in congressional votes. Mr Costa - who is in jail and being investigated for involvement in the alleged scheme - named a minister, state governors and congressmen. Among them were members of the governing Workers Party and groups which back President Dilma Rousseff. But the list of names published by Veja magazine also included rivals of Ms Rousseff. Mr Costa was arrested in 2013. He struck a plea-bargain deal with prosecutors before providing the names. Many of the politicians mentioned have denied involvement. The BBC's Wyre Davies in Rio de Janeiro says the latest allegations could hurt President Rousseff. During her presidency, Petrobras has dramatically underperformed and its costs rose sharply.